Two years and 22 versions since its first release, we and many of our users believe that local discovery using Localscope has evolved to become one of the best things that one can do using the iPhone. For a while now, we have been feeling a strong urge to bring this value to every iPhone user in the world and not just the ones who pay us before they experience it. 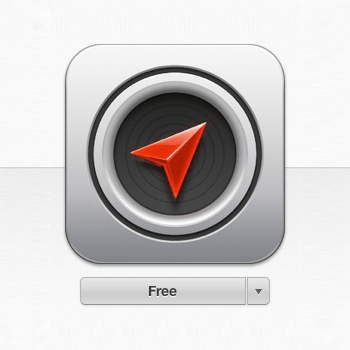 Today, we are excited to announce that Localscope will be available as a free download on the App Store. Localscope’s unmatched location discovery experience lets users browse local information from diverse services in an amazingly intuitive list view with realtime direction pointers and distance meters, lay them out on the map, or look through the state of the art augmented reality view to spot the results in the real world. The entire Localscope experience is now available to consume geo-tagged information from 5 key services: Google, Facebook Places, Panoramio, YouTube and the Reminders app for free. The Localscope Premium paid subscription provides a broader set of local information from a continuously increasing portfolio of integrations with diverse geo-information and social media services including Foursquare, Instagram, Wikipedia and more. Localscope Premium also provides integration with a large number of paid navigation apps such as Tom Tom, Navigon and others for turn by turn directions. 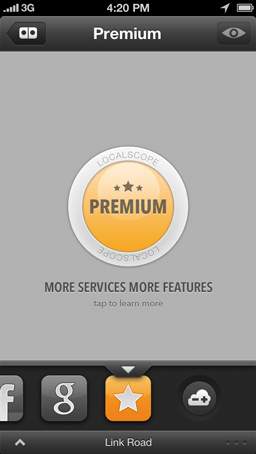 Localscope Premium is available as an in-app purchase at an annual price of US$1.99 or equivalent in other currencies. Localscope wouldn’t have made it this far without the feedback and love from its early adopters. In appreciation of the support from Localscope users who have paid to download the app prior to v3.1, we are providing them with an exclusive lifetime Premium subscription. The upgrade will be automatic when users update to v3.1 and the full set of services will continue to be available to them forever, at no extra cost. Localscope now integrates with the brand new Google Maps app for both free and premium users. It smartly detects if the Google Maps app is installed on a user’s device, enabling them to launch the app to navigate to a discovered location from within Localscope. V3.1 introduces an integration with Navibridge by Denso to enable users to send locations to their JVC / Kenwood in-car GPS powered receivers. Also new are integrations with Gokivo GPS Navigator and Geobyte GPS Navigation UK and Ireland for turn by turn directions. These integrations will be available for Localscope Premium users only. We are excited to bring the Localscope experience for free to iPhone users worldwide and we’d love to hear what you think of it.